Built-up Area Boundaries or BUAB (black line shown here) are drawn on maps around certain settlements to distinguish, in planning policy terms, the main built-up area from the countryside. Within these defined Built-up Areas planning policies establish in principle an acceptance of many forms of development. Outside of these Built-up Areas, in the ‘countryside’ development is usually only acceptable in specific exceptional circumstances. 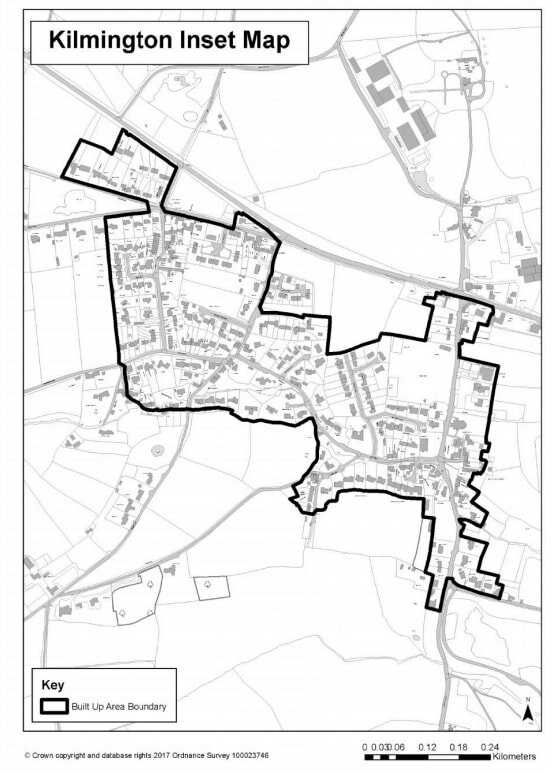 In principle therefore, development in Kilmington would be centred within the BUAB black line, increasing the density of the existing village settlement. However, where a local community prepare a Neighbourhood Plan they may specifically allocate sites and/or include criteria based or other policies for promoting development/ land uses beyond the boundary. 1. It would be compatible with the character of the site and its surroundings and in villages with the rural character of the settlement. 2. It would not lead to unacceptable pressure on services and would not adversely affect risk of flooding or coastal erosion. 3. It would not damage, and where practical, it will support promotion of wildlife, landscape, townscape or historic interests. 5. It would not impair highway safety or traffic flows. 6. It would not prejudice the development potential of an adjacent site. For the main Local Plan the boundaries relate to the Towns of East Devon. For our Villages they will be defined in the Villages Development Plan Document. Where a local community prepare a Neighbourhood Plan they may specifically allocate sites and/or include criteria based or other policies for promoting development/land uses beyond the boundary. Such ‘outside of boundaries’ policy provision would supersede relevant constraint considerations set out in ‘Strategy 7 - Development in the Countryside’ and also other relevant constraint policies. 1. Land form and patterns of settlement. 2. Important natural and manmade features which contribute to the local landscape character, including topography, traditional field boundaries, areas of importance for nature conservation and rural buildings. 3. The adverse disruption of a view from a public place which forms part of the distinctive character of the area or otherwise causes significant visual intrusions.